As an Agriculture teacher and Meyer Hatchery team member one of my favorite topics to teach about is poultry. There are so many topics and discussions to cover that I could teach a year round class on poultry alone and would not be able to cover everything. With that being said, I do believe it is important to understand the anatomy of the egg itself. The actual egg has 8 different parts: Shell, Yolk, Vitelline Membrane, Air Cell, Chalazae, Albumen, Inner Membrane and Outer Membrane. Each part of the egg serves a different purpose. Shell: This is the outer layer of the egg which is made up of Calcium Carbonate. The shell contains between 7,000 to 17,000 tiny pores which allow moisture to pass through. The Bloom or Cuticle, which is the outermost coating of the shell prevents bacteria and dust from entering into the egg. Inner and Outer Membrane: These strong membranes are made partly of keratin and are found lying between the eggshell and eggwhite. They fight off any bacteria trying to enter the egg. Air Cell: The air cell can be found between the inner and outer membranes of the egg’s largest end. After an egg is laid the air space develops while the egg is cooling and contracting. Albumen: This is also known as the Egg White. The albumen consists of four different layers that alternate between thick and thin, consisting of 40 different proteins. The egg white is the main component of the egg in addition to water. Chalazae: Serves as the yolk’s anchor making sure the yolk stays in the center of the egg. When the Chalazae is very prominent, your eggs are fresher. Vitelline Membrane: This is the clear casing that encloses the yolk. Yolk: The yolk contains the most minerals and vitamins in the egg. It contains calcium, iron, phosphorus, thiamine, riboflavin, Vitamin A, and Vitamin D. The yolk is made up of more protein than the egg white and also contains less water. Depending on the feed and breed of your hen, the yolk will vary in color from slightly yellow to deep orange. A fun project I like to do with my students after they are able to identify and understand the 8 parts of the egg, is to cook for them. I usually bring in an electric griddle and we whip up some yummy breakfast favorites. We cook the eggs all different ways such as scrambled, sunny side up, over medium, etc. I will be honest, if you do not have a stove top where you are cooking, it’s much easier to hard boil the eggs at home. 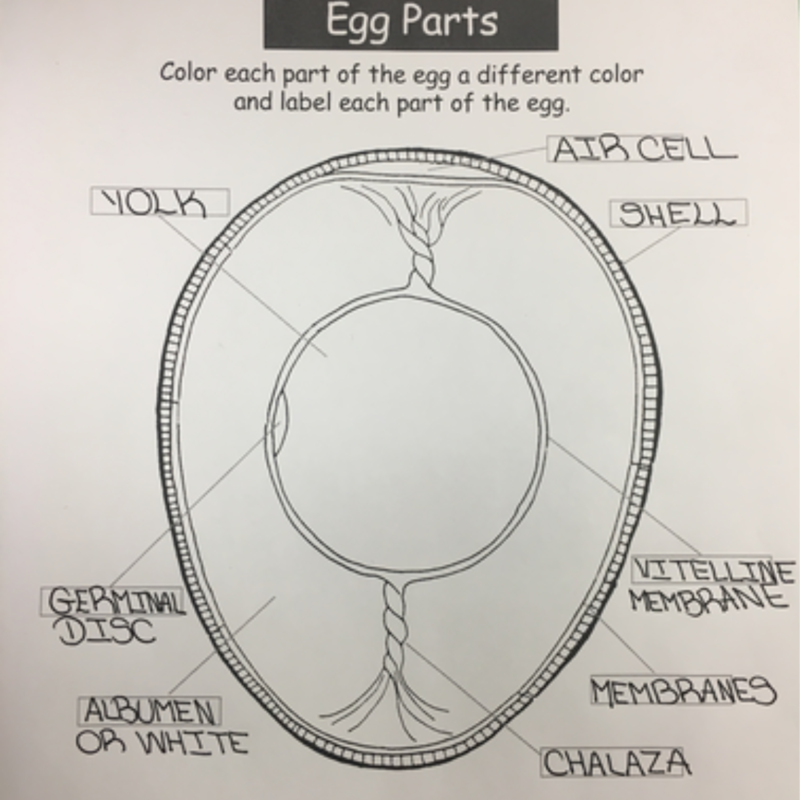 This activity gives the students opportunities to learn different ways to cook eggs, understand which part of the egg contains specific proteins and vitamins, and my favorite part is to show them that when you cook hard boiled eggs, the indentation at the bottom of the egg, is actually caused by the air cell. Keep Calm and Egg On. One of the most enjoyable things about keeping chickens is the vast range of different colors and patterns that the chicken breeds can display, allowing us all to have a beautiful flock. But in a few breeds, the chick you receive in your flock may grow up to not resemble the breed’s photo on our website or in our catalog. Here’s an explanation of why the blue chicken breeds will also have black and splash chicks as possible color variations you may receive. Using the Incredible Egg Washer Kit: Clean Eggs Sell! You can certainly use plain hot tap water to wash the eggs, but I have found the Incredible Egg Washer kit to be a much more effective and efficient way to clean the eggs. Since I have a large flock and gather about 60 eggs a day, I was spending about 30 minutes hand washing each egg at my kitchen sink. Dual purpose chickens are a great addition to any flock. 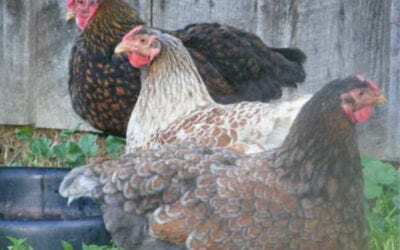 A dual purpose breed is one that lays eggs consistently as well as being a breed that can be a meat provider. Dual purpose breeds are commonly a heavy breed, and are hardy as well. Here are some excellent dual purpose chicken breeds.